The new year is a time when many households, including mine, take a good long look at our finances. 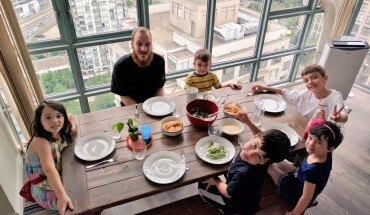 As a father of five small kids, I’m particularly interested in how other families organize their finances to achieve a good quality of life with the resources at hand. Last week, two articles on this topic grabbed my attention, although, as you will see, one family was having markedly more success than the other. 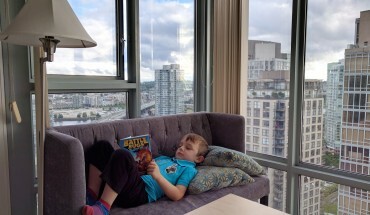 The first piece was from one of my favourite sites, Mr. Money Mustache, and discussed how Mr. and Mrs. MM had managed to keep their family’s annual expenses down to (brace yourselves, Vancouverites) just over $25,000 per year. The second one was featured in the Globe and Mail, and told the eye-popping story of a Vancouver couple who are earning (brace yourselves again) $450,000 a year – and having trouble making ends meet. The familiar chaos of a mixed use, small space (i.e. our living room). Once I’d put my eyeballs back into my head, I re-read both pieces and realized that there was a common thread running through them: you need only as much money as you think you need. In other words, if you want to free yourself from heavy financial burdens, you will need to park your ego at the door, and adjust your expectations and probably your lifestyle. Period. For example, maybe home ownership isn’t for you: in North America home ownership is touted as the be-all and the end-all of adult life, but often you can save more by renting. Seventy percent of Europeans rent, as opposed to just 30% of Canadians. 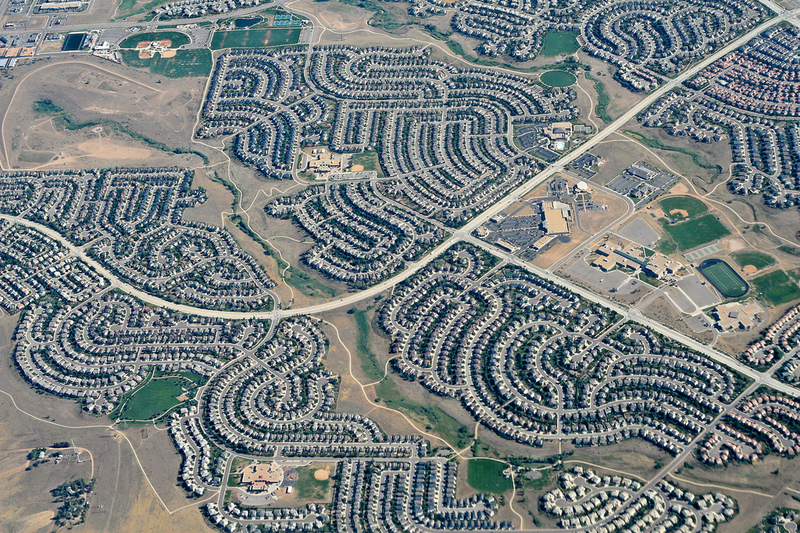 The kind of suburban sprawl that gives me cold sweats. Many urban dwellers, in Vancouver and Toronto in particular, have emigrated to the ‘burbs to escape the high cost of downtown living, only to end up mortgaged to the hilt, pouring all their money into renovations and upkeep, and running two or more financed cars to get to and from work – downtown. Inexpensive suburban living may just be a fallacy. Europeans, on the other hand (to name just one example), have no problem with the idea of renting their homes. And neither did we, we decided: we rent our condo for just over $2000 a month, which is less than what we’d pay for a mortgage on a multi-bedroom monster home, and with less taxes, less hassle, no repair/overhead costs, and loads of convenience. 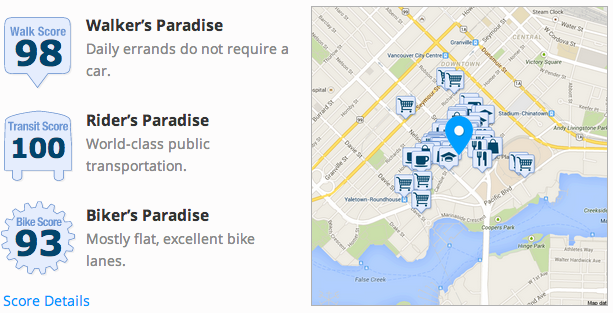 The walkability of our downtown neighbourhood. 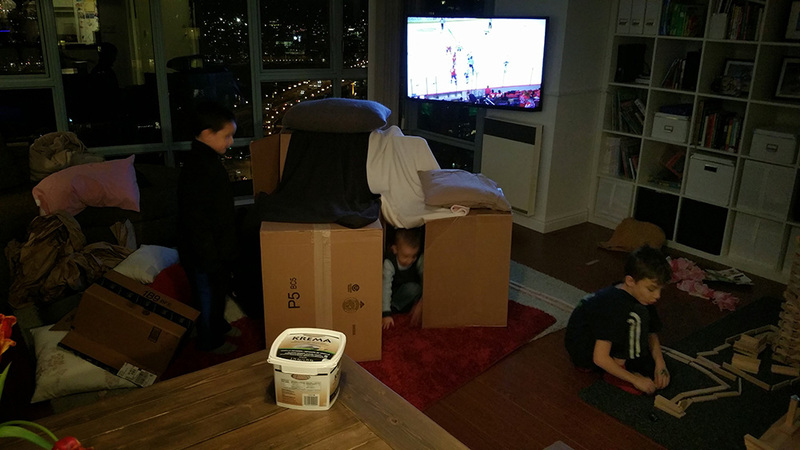 For our money, we get two bedrooms and a big (for Vancouver) “den” in one of downtown Vancouver’s nicest neighbourhoods. If an appliance goes on the fritz, the landlord fixes or replaces it. We have access to a gym and a pool right downstairs, with the cost included in the rent. My office, and our dentist, accountant, lawyers, financial advisor, grocery, pharmacist, bakery, butcher (the list goes on), can all be accessed via a leisurely walk. We own so few “things” that we’ve been able to convert our in-suite storage unit into an art room for the kids, where they can paint with abandon. 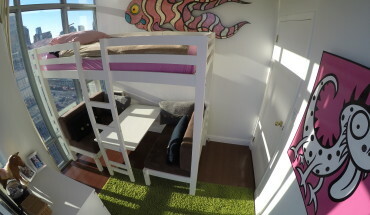 And our condo is so compact, we can clean it top to bottom in about 30 minutes. For families with kids, school is another big decision – and potentially another massive expense. Sure, private school can be wonderful, but with five kids (as Mr. and Mrs. 450K discovered), this can take a big chunk out of your bank account. In Canada, public schools are almost always an excellent option, and all five of my kids are or will be in the public system, which saves us between $30 and $40K a year, minimum. If you don’t like public school and your income and schedules will support it, consider home school. There are alternatives if you look. And what about your car? Are you driving what Mr. Money Mustache calls a Brand-New Gas Guzzling Luxury Racing Bus? How about downsizing, driving an older/pre-owned vehicle, or (for urban dwellers) not owning a car at all? 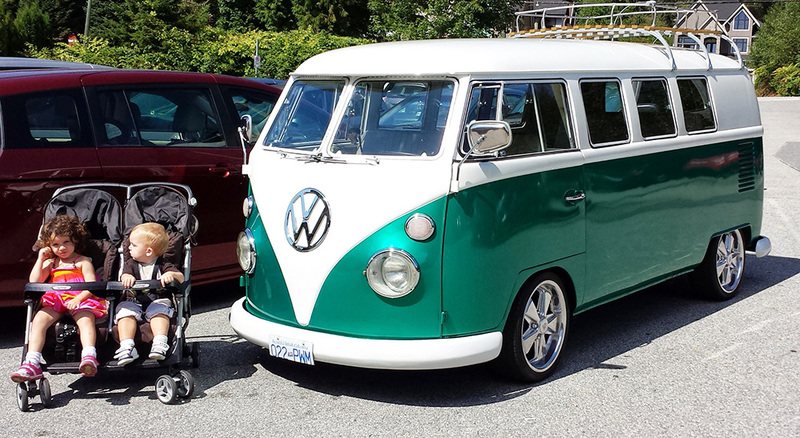 I’m not completely immune to car envy… this one would be a dream of mine (if it wasn’t so expensive). These are all transportation options my family considered, and we ultimately decided that our trusty old $2800 Dodge Grand Caravan (complete with the battle scar on the door) suits us just fine for those rare occasions when we need to drive the kids somewhere. It may look like hell, but it works great, it holds everyone, and it even has Bluetooth connectivity, which I added for the princely sum of $40. The list goes on and on, but the basic tenet at the bottom of all this is that many of people’s financial decisions are driven not by necessity but by ego: “I deserve a house with a man cave so I can rest up after my day.” “I want a flashy car to reflect my awesome job, and dammit, I’ve worked too hard to drive a crappy car!” “Our kids need to go to private school because public school is for average minds.” And on and on it goes. 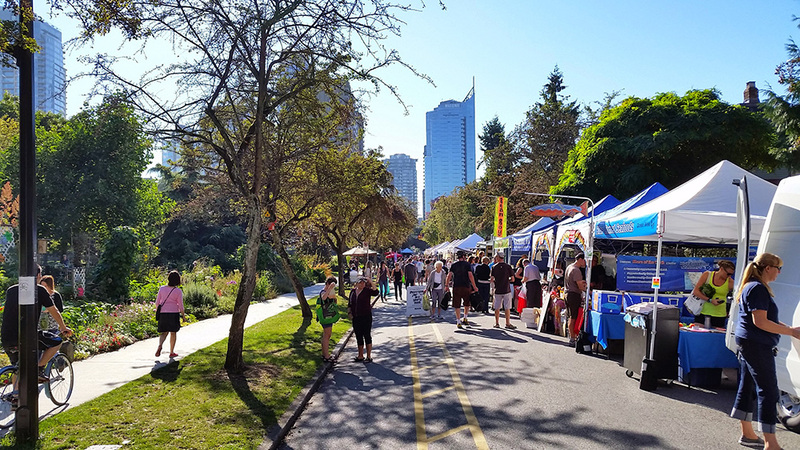 A summer farmer’s market in the center of downtown Vancouver. I’ve had all these voices in my head at one time or another. But now, when they start clamouring for “More! Bigger! Better! Spend, spend, spend!”, I remind myself about why we’ve chosen to “live below our means,” as Mr. Money Mustache phrases it, in a smaller place, with fewer vehicles, in a location close to where we work and play. Downsizing our expectations has saved us thousands of dollars and countless hours of stress. It’s brought my family closer together and made us more fit, healthy, and resourceful. We spend less time strapped into a vehicle, less time fretting about expenses and appearances, and more time doing the things we want to do with the people we want to do them with. I very much enjoyed this article! Definitely people underestimate how much stress can be eliminated by living within their means.